Recently, while attending the High School Teacher Day at the ACS National meeting in New Orleans, we were given Wack-A-Pack™ valentine balloons and encouraged to play with them. 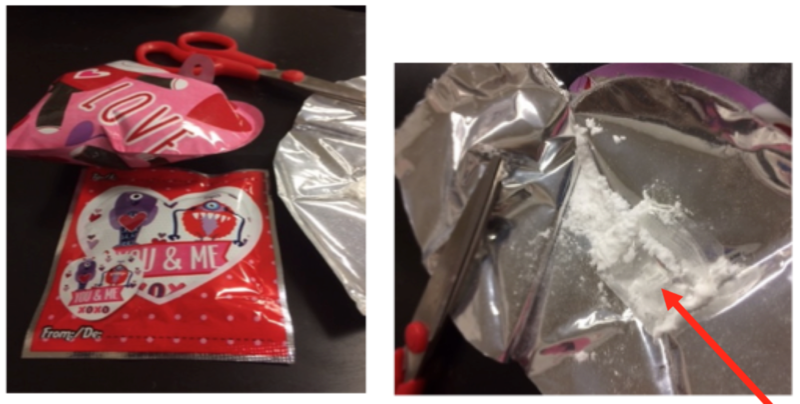 I am a huge fan of finding chemistry in the real world and using it as an integral part of my instruction; and as we were experimenting, I was reminded of a rather fun activity I had done on Valentine’s Day with my AP students. They were finishing up a unit on acids and bases and with the possibility of being disturbed by Singing Valentines (a school tradition) looming on the horizon I thought it would be great to do a little reviewing. What better way than to explore the Wack-A- Pack™! The chemistry behind these little gems is the reaction between citric acid and sodium bicarbonate – in essence an effervescent antacid in a heart-shaped, Mylar™ container. I gave each student a valentine and had them “whack it.” What followed was an opportunity to explore equations, gas laws, and acid-base chemistry along with a chance to do a little lab work. Write the balanced equation for the reaction between an aqueous solution of citric acid and solid sodium bicarbonate to form water, carbon dioxide and sodium dihydrogen citrate? Assuming that sodium bicarbonate was limiting, what was the minimum amount of citric acid (in moles) required for the reaction to inflate the balloon? What was the concentration of the hydrogen ion in the citric acid solution, Ka1 = 7.4 x 10-4? What was the pH of the solution? Students were on their own to find the volume of the inflated balloon as well as the temperature and pressure, and they had access to various glassware, pressure sensors and temperature probes. As with many spur-of-the-moment activities, the proverbial “can of worms” was opened. During the lab, my students needed more information, resulting in a dissection of, at minimum, two balloons: the first was during the actual lab, whereupon I took some rudimentary measurements of a ruptured packet and provided the students with a reasonable volume for use in the calculations; the second was after the fact where I used an uninflated balloon to determine for sure, which substance was where (figure 1). On testing the powder in the balloon it did not react with water and turned litmus blue, so it was pretty clear that the powder was baking soda. The perforated packet contained a liquid and was the only other material inside the balloon, leading me to believe that the liquid was a solution of citric acid (figure 2). Additionally, if desired, could now know the volume of the citric acid solution with some degree of accuracy. Citric acid is triprotic, with Ka values ranging from 10-4 to 10-7. In order to simplify the calculations, I chose to make the assumption that the sodium bicarbonate was limiting and that the first hydrogen was the only contributor to pH. I realize this is not completely accurate, but the AP test does not require students to do the messy calculations for polyprotic acids with Ka values in such close proximity to one another. I did test the pH of the citric acid solution, as a part of my post-lab dissection, and it was very close to what we had calculated. This activity is still a work in progress, but for a first time endeavor it went much better than I could have hoped, with the students enjoying themselves and stepping up to the new challenge of the day. I hope you are able to use the activity and please, send suggestions and thoughts for improvement. I purchased my Valentine balloons at a local Dollar Tree store (4 balloons per package), but they (Valentine, birthday and Easter themed) are also available online through Dollar Tree and Amazon, among other vendors. I think you will find that the Wack-A-Pack™ provides for a pretty fulfilling day of chemistry. Well done! This activity ties in so many topics. Did they do the Stoichiometry or submerge the inflated balloon under water to determine its volume? Will have to print this off and save for next years NGSS units! Thanks. Thanks Doug. Most of the kids used displacement to find the volume and then did their calculations using the volume from the displacement, and the pressure and temperature from the probes that I put out. We actually got pretty good results and it was good for them to struggle a little!